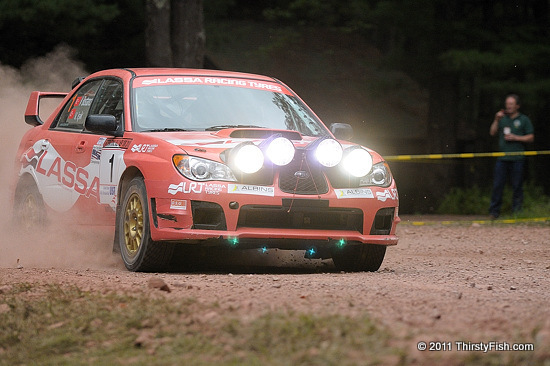 This is a photograph of the car driven by Volkan Isik in the 2010 International Rally New York. A number of people have asked me why anyone might go to the trouble of using the Manual Mode on their Digital Cameras. It seems choosing Shutter Speed and having the camera adjust the Aperture (which controls the depth of field), or the reverse, makes perfect sense to them, but Manual Mode is too much trouble. This photograph perfectly exemplifies situations where Manual Mode is the only real option. As the evening approached and the light became low, I switched to Manual Mode because I expected some of the cars to turn on their headlights. In a fast paced rally, a car stays in the frame for about one second; there are no second chances. The meter in the camera guesses the exposure for the scene. If the guess is wrong, then we end up with unusable, under or over exposed images. The powerful headlights almost always result in underexposed images because the meter tries to adjust to the overall brightness of the scene. When Manual Exposure is required, I usually expose by pointing my camera to something that is a mid-tone in the direction of where I anticipate my subject will be (eg. the grass). Then, I take a few test shots, adjusting the Shutter Speed, Sensitivity (ISO) and Aperture until the scene looks correctly exposed. Remember, the car itself is illuminated by natural light, not by its headlights!